When I read April’s topic for Blogs of the Round Table a single game immediately jumped into my head. Breath of Fire Dragon Quarter is a uniquely wonderful RPG and a great example of a game that always keeps the scope of the journey in view. I could gush for pages about this game, and it deserves lot’s of writing for many different reasons, but I’ll try to save that for future articles and stay on topic. While the narrative of the journey is well done, the game shines through its use of mechanics to back it up. This article is spoilery for the first half of the game and the main reason for going on your journey, but not much beyond that. Also this game is over 15 years old so just go play it if you haven’t yet. Humanity has been sealed underground for the last thousand years because of a war that destroyed the surface. Most normal people don’t know if the sky is even real or just a myth. The poorer you are the lower down you live and the worse living conditions/air quality are. The story starts with Ryu, a Ranger grunt working in Low Sector. He does menial missions clearing new tunnels of monsters, guarding cargo deliveries etc. On one delivery you get ambushed, the train you are riding wrecks, and you discover that the cargo you are delivering is a small girl. She is unable to talk and you discover that her “wings” are actually extensions of her lungs meant to act as air filters. Your superiors say that she is a flawed model and needs to be destroyed. You feel the need to protect her but know that she will die quickly in the polluted air. You have heard rumors of The Sky, a place where the air is clean, and decide to do whatever you can do take her there. Everybody else is trying to stop you. Obviously there is more to it but that’s it in a nutshell. So you are deep underground and your goal is the sky. 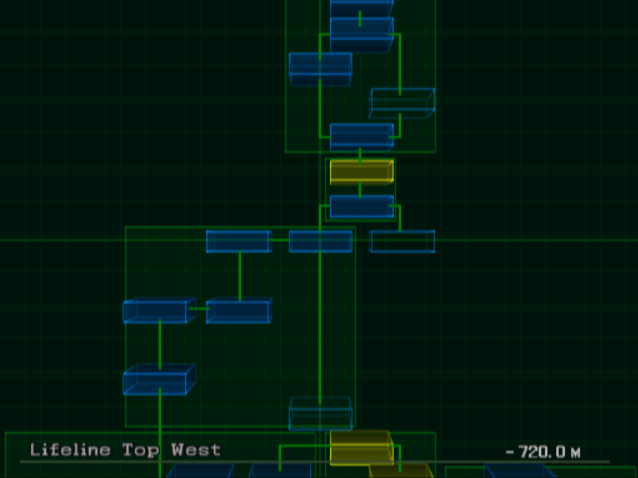 Two main mechanics keep the player constantly focused on their journey’s scope. Much of the game narrative exists to reinforce these. Other things make the journey feel more arduous, like having limited space in your inventory, but they all exist to reinforce the struggle aspects more than the scope. 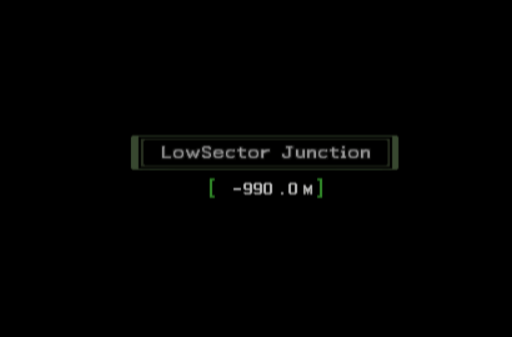 The names of every location come a suffix of their depth, something like “Old Waste Shaft 4F [-1180.0M]” or “Centre 2F North [-480.0M]” gets displayed every time you enter a new area. It’s also the top piece of information on the minimap, and one of only two numbers that are on the screen while you are outside of combat. The main screen of the map page reinforces the idea of depth by just giving you an elevation view of how the different areas are connected, telling you that you are above or below an area seems to be more important than an actual map. While Ryu never says “We have 800 meters left to go” this information gets drilled into the player. Even before the main quest of the game kicks in, you are made very aware of your position relative to the surface. Once you know reaching the surface is your goal, you are painfully aware of it’s distance and constantly reminded of how much further you have to go. The best known mechanic of the Breath of Fire series is the protagonist’s ability to turn into a dragon during combat. 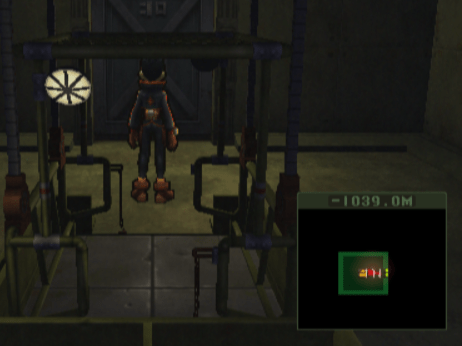 While every game in the series implements it slightly differently, this game strays farther from the rest due to the interconnectedness of this mechanic and the plot. Essentially Ryu is slowing losing his humanity to the dragon power that is now inside him. If he loses all of it the dragon bursts out permanently and it is game over. Once you obtain this power you gain a meter in the top right of your screen. It simply shows a percentage under a fancy cube, but it is always there. You can’t not be aware of what the percentage is. Which is important to the game mechanically because if it reaches 100% it’s game over. Not like you died and have to reload from your last save flavor of game over, like permadeath you have to start the whole game from the beginning (Which is why the game has new game + mechanics built in). 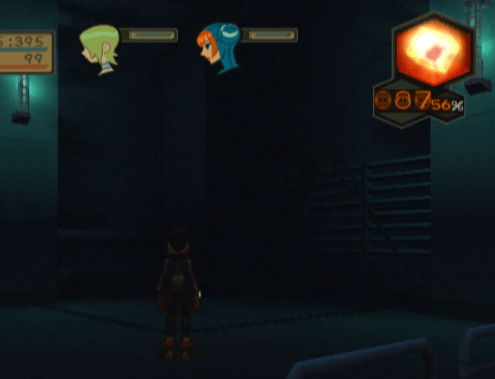 So keeping the meter from reaching 100% is extremely important. Fortunately it starts off low and there are only two things that increase it. Unfortunately one of them is walking. Yes, walking. Every ten steps or so it will increase one hundredth of a percent. This actually has almost zero mechanical effect because the game isn’t that big. You could walk beginning to end several times and be fine. It can have a huge psychological effect and stress you out though. This method of it increasing really only exists to let you know that you have a time limit. You have no option to give up on this quest and go back to normal; attempting to walk around town and resume your normal life will still result in your end. The clock is ticking. The other way the meter increases is by using your dragon form. Transforming cost 1% initially and 2% more every round. There are a variety of moves all adding 1% to 2%, and even a breath move that lasts as long as you hold the button so you could blow all 100% in one go if you wanted. It is fairly typical to add 8-12% in a couple rounds of combat. Which means you must be cautious of the amount of times you transform. Why would you ever want to use an ability that has such a steep cost? Because it is powerful, like more than ST Akuma level of broken power. Honestly, I cannot think of a mechanic in any other game that has this relative level of power. So powerful that it needs a mechanic like the D-Counter as a counterbalance. You can easily kill any boss in the game, including the final one, in a single round if you are willing to spend enough percentage points. But the meter is always in the top right of the screen reminding you of how much humanity you have left to lose, and you are constantly being tempted to give up just a little more and take the easy way out in combat. These two mechanics coming together give this game’s journey a distinct feel among RPGs. They show you a distance, give you a time limit, and ask “Do you have enough strength to make it to the finish line?” The mechanics wrapped together with a strong narrative, good art style, and great music make a wonderful experience which is all about the scope of the journey. Dragon Quarter was my favorite Breath of Fire, even if I was one battle away from beating the game and quit in frustration 15 years ago. I have nearly the exact same thoughts on the D-counter system, and I love this game immensely and I hate how I can’t actually find a copy of the game (or a working PS2) to play it on now. I hope that you’re able to come across a copy and try again sometime. The game can definitely be frustrating. It’s too bad the game doesn’t explain itself better. I know many people missed out on this game because of the way saving works or just the fear of playing an RPG with a timer. Once you know how it all works and have been through it a couple of times it feels very different from the initial play through, but it gives you a different appreciation for the game as a whole and how all the parts fit together. I dug up my PS2, and it runs, but it won’t play any discs anymore… I could consider an attempt at emulation, though doing so is quite time consuming. Always wanted to play this one. Enjoyed watching it.